I think the most common problem I've come across in three and a half years' worth of Trader Joe's reviews is blandness. TJ's foods seldom taste bad in my opinion, but they occasionally taste like nothing at all. I don't know that we've run into that problem much in recent history, but it has been an overarching trend since the beginning of this blog. TJ's foods are at least as "healthy" as food in mainstream grocery stores. And for some reason, I feel like they seldom offer foods with terrible textures—granted, many TJ's products are far from perfect in the texture department, but the "feel" of their foods is usually at least acceptable. 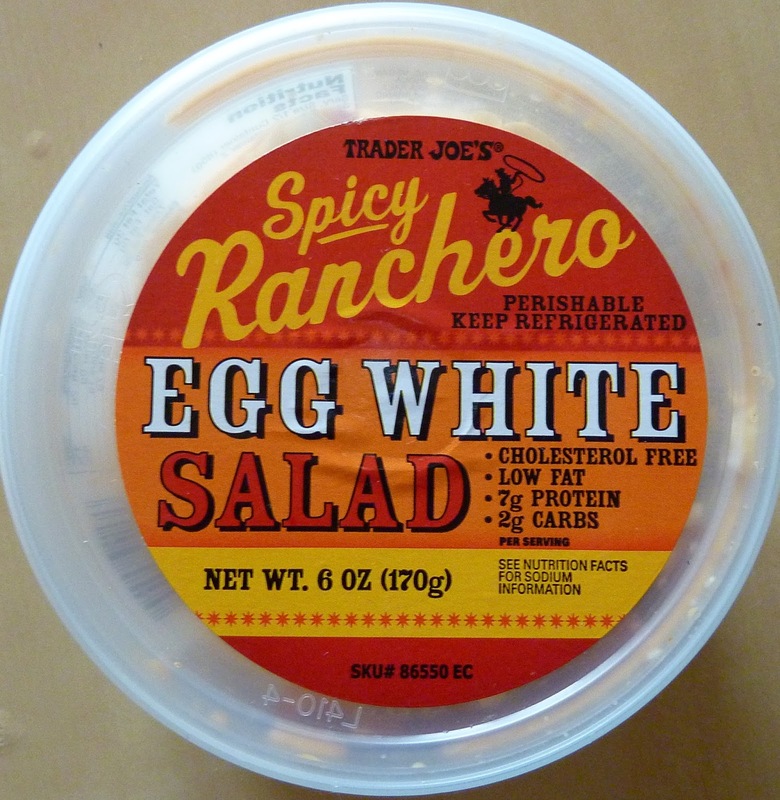 So yeah, I think a lack of flavor is one of the few negative trends we've discerned among Trader Joe's brand food products. That's what we've got here. After eating a forkful of this product, I smacked my lips and desperately tried to taste it. Eggs? Mayo? Anything? There might have been hints of vinegar or something, but I couldn't really tell. So just as I was about to give up and take another forkful, a mild to moderate tingling came over my tongue. "Ah, that's the 'spicy' part mentioned on the packaging," I thought. Sonia swears she actually tasted bell peppers. There might have been traces of pepper like from a pepper shaker, but I didn't notice the taste of any vegetables. 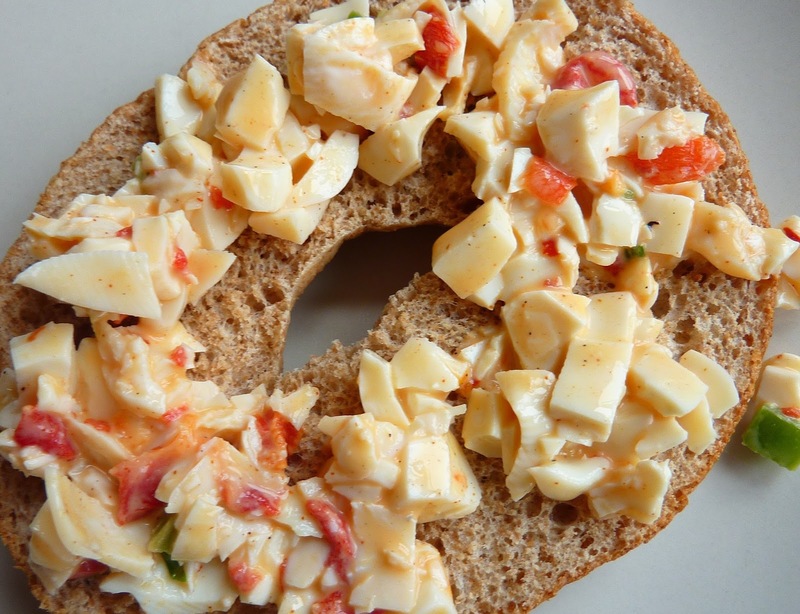 To me, this egg salad was like a bit of hot sauce with an unusually complicated texture. But I liked the texture. Sonia didn't. She thought the eggs were too firm. I agree that they were firmer than normal egg whites, which was weird, but I found that to be a welcome surprise in an otherwise totally unremarkable product. You can also feel little bits of vegetabley things and a semi-velvety sauce. It had a nice mouthfeel. And FYI, "mouthfeel" is not one of my many made-up words. Food rheologists use it all the time...apparently. Although someone will inevitably disagree, we're gonna go ahead and tell you that this isn't a great stand-alone food. Neither of us could eat it straight out of the tub the way we could the Curried Chicken Salad. Truth be told, this egg salad isn't terrible when eaten with other foods because it's so neutral. It just adds a little tingle to whatever you're having. You can't even taste the 360mg of sodium in each serving. But in the end, Sonia and I both say "fail." 2 stars from her, 2 from me. Bottom line: 4 out of 10. I've tried both, and I actually much prefer the other egg salad, the one with chives, I do add black pepper to it, because it's also a bit bland. But it's not quite as lost as the ranchero. I tried to like this one SO BAD, but I couldn't get past the texture as well. It needs more ingredients because it was very... 2-dimensional in flavor. Heck, even egg yolks might have made this better.